Great holiday during the exploring time at major historical, cultural cities in Cambodia, old Khmer Empire ruins and history. Visiting the PhnomPenh, Kratie, Stung Treng. Visiting Ratanakiri, Preah Vihear and Kampong Khleang. Welcome to Phnom Penh – the city retains its traditional Khmer and colonial styles with French villas and large tree-line sidewalk. After the short rest you will visit the impressive colorful Khmer-style royal palace complex build in 1866 by the Predecessors of King Norodom. Nearby is Silver pagoda (the emerald Buddha temple), where contain plenty of Buddha Statues decorated and made by gold, diamond, gemstone and silver. We will stop at Independence monument and explore the National museum; a beautiful Khmer architecture building contains more than 5000 art antiques made by bronze, wood, gold, silver, copper, sandstone and others. We pass through the river-front park where 4 rivers met at a junction include mystical Mekong. Walk up to sacred hill Phnom Daun Penh – also the name of a pagoda and name of the capital nowadays. Last visit Central Market, a large market constructed in 1937 in the shape of a dome with four arms branching out into vast hallways with countless stalls of goods. Initial design and layouts are from French architect Louis Chauchon. Dinner and enjoy the night time and overnight in Phnom Penh. - Depend on your arrival time, the program will be adjusted accordingly. 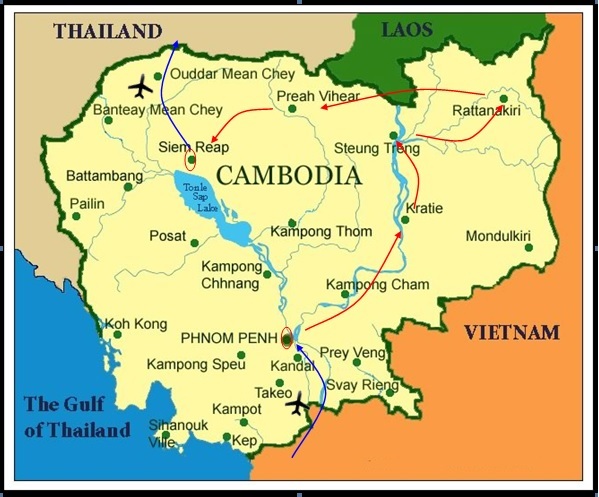 Breakfast at hotel; overland to Kratie with taking around 3.5 hours, arrival at noon time lunch and check in hotel, take your short relaxing time. Mid-afternoon visit Kampi Resort, a great natural resort where is home to Dolphins. Having an excursion to Sambok district for explore the Dolphin preserved area on Mekong River. Then visit Phnom Sam Bok, a cultural and main tourist resort of Kratie province. Return to hotel for your relaxing. Overnight in Kratie. Early morning you will travel by car from Phnom Penh directly to a nature lodge on the river north of Stung Treng, upon arrival depart to Flooded Forest, wake up by the sounds of birds and rare freshwater dolphins surfacing around the island. Following breakfast, you will start your day with a kayaking trip down river through the remote flooded forests of Cambodia’s amazing Ramsar Wetlands. A boat will provide backup. Many varieties of birds live in these forests and the scenery is unique. Lunch will be served at a scenic spot along the river and return to Stung Treng late in the afternoon for your overnight stay. Late afternoon, board a boat and continue to a small island where your camp will be set up on a sandy beach and enjoy dinner around a campfire. NOTE: in sometimes if it is not possible for camping, you will enjoy overnight at the lodge. After breakfast, transfer to Rattanakiri province with taking around 2 hours to reach there. Upon arrival, transfer to visit Yeak Laom Lake, a lake in the middle of a mountain, it was formed many centuries ago from a volcano. The lake is about 800 meters in diameter and 48 meters deep during the dry season. The water is clear and suitable for swimming. Afternoon we will process to Ka Chanh Waterfall – the waterfall was given its name by the ethnic minority in Ka Chanh village. There are a number of scenic rubber plantations along the canal leading to the waterfall. The base of the waterfall which is a lovely place for picnics can be reached by climbing down a 72 steps wooden staircase. Elephant rides to the site are also available. We change to look at Ka Tieng Waterfall instead, located in the middle of lush forest, gets its name from the Kreung hill tribe in Ka Tieng village. Return back with dropping at Local Market, then transfer to your hotel for relaxing. Overnight in Ratanakiri. Morning after breakfast, heading to Preah Vihear province. Upon arrival visit Prasat Preah Vihear: Preah Vihear is known as the Temple Mountain which was built at the beginning of the 10th century as a Hindu temple dedicated to Shiva. The temple had further works added to it by the following three kings. The temple today is still a Hindu site, but Buddhist Monks pray at the temple to the Gods. The temple area consists of three stories surrounded by two galleries. Your guide will lead you through the temple area explaining the sites ancient and recent history. The temple was declared a Word Heritage UNESCO site in 2008. Overnight in Preah Vihear. Visit Koh Ker (Prasat Pram, Prasat Thom, Prasat Balang, Prasat Krachap, and Prasat Damrei Krap): We head into the bush to the remote Angkor capital of Koh Ker. In the 10th century Jayavarman IV (928-942) fell out with his family, stormed off to the northwest and established the rival capital of Koh Ker. Although the capital for just 15 years, Jayavarman IV left a legacy of 30 major temples and some gargantuan sculpture that is on display in the National Museum in Phnom Penh. We visit Prasat Thom, a seven-storey step pyramid, more Mayan than Khmer, with commanding views over the surrounding forest, nearby Prasat Krahom or Red Temple and other temples, including the five towers of Prasat Ling, each enclosing a giant Lingas or fertility symbol, the biggest and best found in situ anywhere in Cambodia. Travel to Kompong Khleang, boat trip in the sunset: Floating Villages, located 10 kilometers south of Siem Reap. Take a ride in a traditional wooden boat on the Tonle Sap, the "Great Lake" of Cambodia and the largest in Asia. Here you’ll see plenty of examples of the Khmer way of life on the Tonle Sap. Enjoy sunset on the boat. Travel to Siem Reap for dinner and overnight. After breakfast, explore South Gate of Angkor Thom known as Big Angkor, 3km2 walled and moated royal city and was the last capital of the Angkorian Empire, The famous Bayon Temple was an architectural muddle, in part because it was constructed in a somewhat piecemeal fashion for over a century. Terrace of the Elephants is an impressive, two and a half meter tall, 300 meter long terrace wall adorned with carved elephants and gradual that spans the heart of Angkor Thom in front of Baphuon - huge temple mountain in the heart of Angkor Thom, Royal Palace Area and Phimeanakas - impressive rite and sandstone pyramid. Terrace of the Leper King is at the north end of the Terrace of the Elephants, a double terrace wall with deeply carved nag as, demons and other mythological beings. Last visit Ta Prohm temple which is a wonderful combination of human genius and natural beauty. Giant trees have grown here for centuries. Lunch at local restaurant. 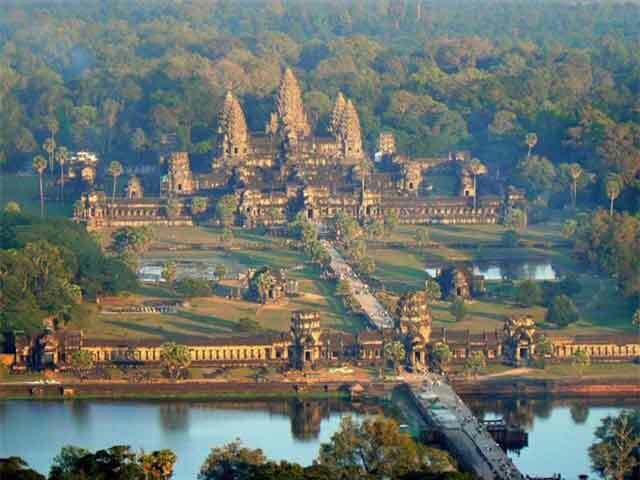 Afternoon visit Angkor Wat temple, the founder of the temple was Suryavarman II who reigned Cambodia from 1113 to 1152 and built the five towers in the 12th century to dedicate to the Hindu God Vishnu. The plan of the pyramidal conception of the temple combined with spaces, alleys, ditches is an ancient masterpiece of architectural design and construction. After the short rest we would have welcome dinner with Apsara, the traditional Khmer dance - drama performance, which are not merely dance but also telling a story. Overnight in Siem Reap. Breakfast at hotel, free leisure on own arrangement until time transfer to airport for flight onwards! On the way if there is time we will visit Puok, the real and original place of the Artisans d’Angkor silk, where you will see the full process of silk producing, from the silk worms munch on the Mulberry leaves to spin their cocoons which used to make silk warp. You of course will see the weaving work and purchase the high quality silk products as a beautiful Cambodia souvenir. Straight to Siemreap airport for your departure! End of services.